Thinking of joining us? Good. We rely on every member we have. Whether you can donate your time, your passion, or your talent. Anything you can do to help makes a difference. Our fight for our rights is your fight too! Our members have joined forces to put an end to discriminatory legislation, to educate and to protect the freedom and safety of all, both riders and non-riders alike. We do this not only to benefit us, but also to promote a better image of motorcyclists in general. ABATE stands for many things, but most of all, it stands for FREEDOM! Included with an ABATE membership are a membership card, state newsletter, and free accidental death/dismemberment insurance policy . 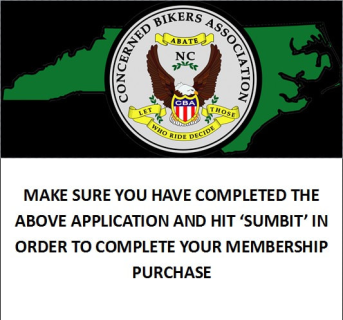 There are no special requirements for joining aside from an interest in promoting motorcyclists' rights, safety and positive image. Everyone is welcome. Our common bond is that we are all passionate about motorcycling. It’s not WHAT you ride, it is THAT you ride that is important. ​1. Fill out the online application below, and click SUBMIT. 2. Then pay below by clicking "ADD TO CART" on the appropriate icon. Finish your application process by clicking "CART" and "CHECKOUT" at the top right to pay the required dues. People 29 and under get one year of new membership FREE of charge!​ Just note age and FREE on the application and submit or snail mail it to the above address. 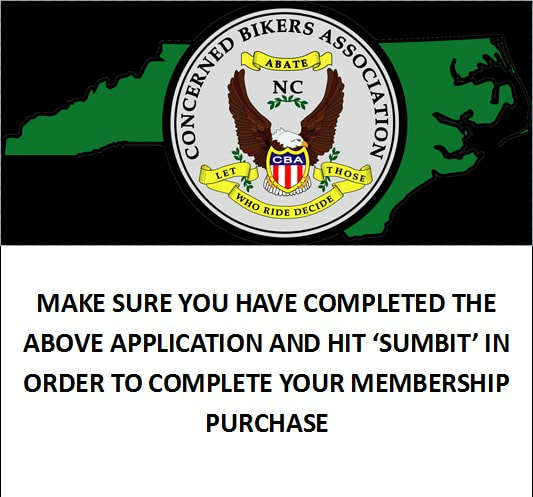 One year membership for a couple to CBA/ABATE of NC.